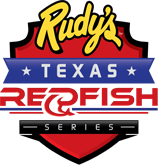 Captains Billie and Mike Kocian have teamed up again this year to compete on the IFA Redfish Tour and The Texas Redfish Series. Capt. Billie and Capt. Mike have competed for many years in amateur and Professional tournaments with different partners. Both have enjoyed success, but in 2007 they began competing as a husband and wife team. Since that time they have finished each year in the Top Ten overall in Texas and ......#1 husband and wife team in the Nation. 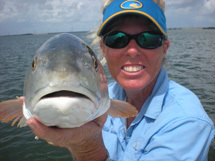 Captain Billie Kocian will be the only Professional Lady Guide this year in the Annual “Babes on the Bay” Tournament which touts over 700 lady anglers and 220+ teams. 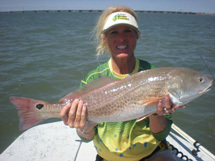 Follow their progress this year on the "Captain's Grog" and by selecting from the tournament links below. Well the first tournament of the year did not treat us well. Fog kept us in the harbor for over an hour and we missed our morning bite. We plodded through the fog for an hour on a trip that should have taken 30 minutes to our first spot. We could only see about 50 yards but we could hear voices all around us. As we were drifting slowly we started to waders headed back to their boat. It turns out that one of them was a good freind of mine who reluctantly told me later that evening that "YOU GUYS WERE ABOUT AN HOUR LATE - WE NUKED THEM BEFORE YOU GOT THERE!" Yes, he is still our freind. We finally put a couple of 22 inchers in the box and we were off to better them. Each spot we found fish the days before, just didn't pay off. At the last spot we drifted, our school came up to the surface and WHAM! it was on! I was fighting a fish and Capt. Billie hooked another only to come unbuttoned. 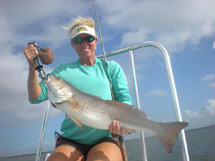 As Igot mine closer, we noticed another fish trying to get the lure out of his mouth and Capt. Billie flipped to him and BAM, we were doubled up again. Now, fish in the net!TOO BIG! And I mean WAY TOO BIG! We did not catch a fish out of that school less than 30". Might as well be 10" in a tournament though. Alas, the wind came up and we headed back North. One final drift in Home waters and 6 quick fish, but all just cookie cutters of our 22's. Well off to weigh in and to tell our SOB STORY for the day. A great day of catching fish, just not the right size. Big Congrats to Mason and Melissa Lincoln for a HUGE WIN.